I love living in a big, beautiful city like Cape Town. We’ve got the mountain. We’ve got the sea. But we’ve also got pollution and lots of it. In fact, some cities have more than 161 days of unhealthy breathing air per year and, after just eight hours of being exposed to it, your skin can bear a gram of pollutants. Keen to see how much pollution’s floating around your face right now? Get clicky clicky over here to try Dermalogica’s new app. It lets you type in your location and it gives you a skin pollution index and even goes as far as listing the dominant pollutant in the area. Eek! I tested a few cities and, it turns out my home town, PE, got 58 so its even higher than CT. Bangkok got 61, New York scored a surprising 43 and Knysna fared the best with 36. Anyway, I’ve been very aware of inflammaging for a while now – every dermatologist I’ve chatted to in the last while recognises it as a concern – but got to learn about it in-depth at a recent Dermalogica launch for a very cool new addition to their line up – Daily Superfoliant (R1 180). We all know about the brand’s best-selling Daily Microfoliant but now its been supercharged to go beyond just cleansing and refining. Thanks to an array of new ingredients it also aims to detoxify, protect against free radicals and prevent inflammatory pollutants from adhering to your skin. So, what exactly’s in the mix? First up, the heavy weight here is activated charcoal to help absorb micro-pollutants. (As Superfoliant is pH neutral, it assists in opening up your pores so its easy to nab anything that shouldn’t be there.) It also contains AHAs (lactic and malic acid) plus papaya enzymes to gently lift away dead skin cells on a chemical level, not just a mechanical one. Last, but not least, it also makes use of niacinimide (vitamin B3), a soothing antioxidant. You only need a small amount to make a dramatic difference. More good news? The Superfoliant’s on a mission to land ’employee of the month’ and doesn’t stop working when you wash it off. It also serves up an ‘anti-adherence’ complex (a mix of botanicals that includes sea moss and algae) that remains on your skin on a microscopic level to help you fend off pollutants as you head off into the big smoke. I’ve been using new Superfoliant for a while now and its fabulous. I’ve compared it to the Daily Microfoliant and it’s definitely the teensiest tad more scrubby but still gentle enough to use every day. As far as the invisible shield bit goes, like I said, this is microscopic so you don’t feel or see a thing – aside from smoother, more refined-looking skin, that is. If you’re looking for a fab face scrub or are already hooked on the Daily Microfoliant but want the added benefits of pollution protection then Superfoliant is going to seriously impress. Also, while it’s part of the Age Smart line, there’s nothing stopping anyone from using it. In fact, I reckon younger skin hassled by blemishes would be ideal candidates due to its charcoal content and soothing properties. Want to try it yourself? You can pick it up at any salon stockist as well as online or a Dermalogica concept store where you can also get a complimentary Face Mapping session. There’s another way to get your mitts on Dermalogica’s Superfoliant too! The brand’s kindly given me one to give away PLUS their new Age Smart Age Reversal eye complex, a potent retinol-infused eye cream worth R869. There are two ways to enter. One is to simply leave a comment on the blog telling me what the pollution level of your city (you can find out over here) OR what your favourite Dermalogica product is. The second is to hit me up on twitter with ‘Hey @lipglossgirl! I’d love to win a @DermalogicaSA hamper’ and be sure to include the link to this post. In order to qualify, regardless of which way you enter, you have to be following Dermalogica on Instagram OR twitter. They’re @DermalogicaSA on both accounts. This competition closes at 5pm on Wednesday the 15th of March 2017 and is open to South African residents only. The winner will be drawn from either pool and decided via a random number generator. This competition is now closed. Congrats to winner Nikhat Hoosen. I got a score of 33 for Cape Town. Would LOVE to try the Superfoliant it looks amazing! Stellenbosch is 42! Not surprising with all the fires here. I got a level of 37 for Cape Town. Such a nifty little feature. Think I will use it everywhere I go. The Superfoliant sounds amazing. Hi Leigh….SPI is 80 for Centurion…..I really want this product!! 🙂 Favourite product at the moment is the Breakout control and the oil control lotion! My favourite product is the daily resurfacer, individually packaged exfoliator pads that fit on your finger making it very easy to use for lazy girls like me, I’ve started using dermalogica in November and can notice the difference in my skin would be great if I could add this to my range. 30 in my hood. Think it’s hovering at the old age home up the road. Wow I got a 43 result for cape town now..what a wake up call..my skin really needs this.. Thank you for sharing this with us..
My Favorite Product is the Dermalogica Skin Hydrating Masque. A wonderful and absolutely effective product for my skin. My skin looks great and feels good and is well hydrated. Perfect for the warm climate that effects My skin and leads to dryness. My fave product is Daily micro exfoliant / Cape Town index for today 28 and main pollutant is smoke particles! Oh em geeee! Loving this!! I am obsessed with their Daily Microfoliant, it’s my #1 exfoliator!! I checked the pollution in Durban and we are at a very high risk (66) with fine particulate matter being the dominant pollutant. Accelerated aging – NO THANK YOU!! Durbanville 39, my favourite Dermalogica product would have to be the Daily Microfoliant. Cape Town @ 10:50 am – The Skin Pollution Index says its 35 at a moderate risk of accelerated skin aging. and the dominant pollutant is Nitrogen Dioxide. would love to try out Dermalogica’s new daily superfoliant powder exfoliant to lower my risk of accelerated skin aging. Port Elizabeth is 52. Wow i did not expect that. Cape Town, WC 12:20pm is 26! Best news ever was Dermalogica announcing this new product! Working at a Manufacturing Plant this will be my new best friend! Barrier Repair & Daily Microfoliant is my absolute necessity. Congrats hun! You just won that Dermalogica hamper! Will be in touch in a bit to get all your details for the PR. Holy smokes! Jozi’s pollution is a high 64. I’m in need of a Cape Doctor in the form of Dermalogica. Charcoal Rescue Mask is awesome as is the MediBac skin clearing mask both are effective yet gentle. The pollution index is at 25 for Morningside, Durban. I’d love to get my hands on this! My favourite product at the moment is the superfoliant powder exfoliant. With the 56 rating of pollution in the Cape Town CBD at only 11:30 AM this product is a must. Pollution statistics are so scary!!! 39 in Port Elizabeth! Fave product is the Precleanse…it’s amazing! My fave product at the moment is the Ultra Calming Mist. Pollution index in Cape Town today is 44. Eina! 48 for Glenwood Durban , oh dear! From Port Elizabeth with 62! Durban North is 55 😦 thought it would lower! Would love to give Dermalogica Superfiliant a try! I got a 35 for Cape Town and my favourite product is the Special Cleansing Gel! My favourite Dermalogica product is….all of them! Seriously I would have to say it is combining the Hydrating & Multi Vitamin masque as an overnight masque. Shared on Twitter. And Cape Town today was 37. 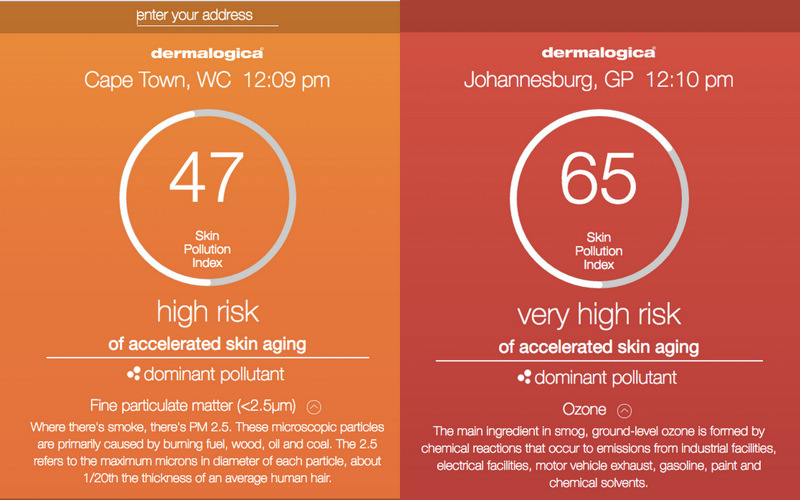 The Skin Pollution Index for Klerksdorp is 65 – very high risk! Eeek Cape Town today is 44. Also shared on twitter – this Superfoliant looks amazing! My favorite Dermalogica product is the Dermalogica skin hydrating masque. My favourite product is the antioxidant hydra mist. It refreshes my skin when it feels parched and leaves it dewy and plump. Cape Town at 37 today. I’ve never owned any Demalogica products would love to try the Superfoliant. Eish! Pretoria East is 72!!!!! Amanzimtoti – level is 71!! Wow that is awful news indeed! 55 here in Century City, Cape Town. Cape Town CBD is at 63 – yikes! Cape town at 43% I would looove to win this! skin care is only on my radar of late and it’s scaring me!